A portrait thought to depict one of the most notorious characters of the Jacobean age drew strong bidding in Canterbury. The 2ft 6in x 2ft 1in (76 x 63cm) oil on canvas is believed to depict the English noblewoman Frances Howard (1590-1632), who was found guilty of the murder of Sir Thomas Overbury along with several accomplices, including her second husband the Earl of Somerset. 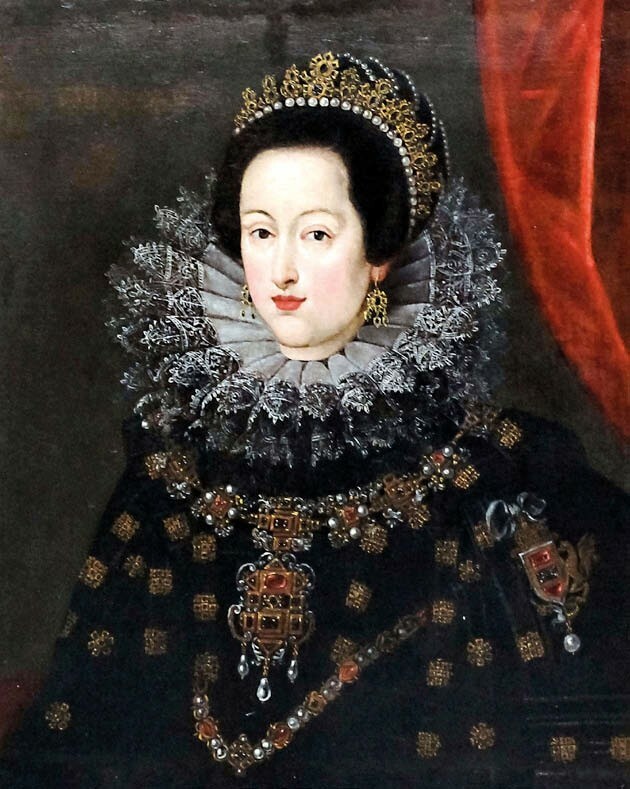 She was spared execution and eventually pardoned by King James I. Catalogued by Canterbury Auction Galleries (20% buyer’s premium) as ‘early 17th century English school’ for the February 6 sale, it depicts the sitter wearing a pearl and jewelled headpiece, a lace trimmed ruff and collar and a black jewelled cloak. That forms an altogether more conservative depiction than the daringly provocative portrait painted by William Larkin (c.1580-1619) that hangs in the National Portrait Gallery in London. The picture was accompanied by The Trials of Frances Howard – Fact and Fiction at the Court of King James, a book written by David Lindley and published in 1993 that re-examines the murder trials of Howard and the historical representations of her as ‘a wife, a witch, a murderess and a whore’. The vendor said they had acquired the portrait when going through “a Tudor period”. The lot was knocked down to a Yorkshire phone bidder for £8000, more than five times the guide. 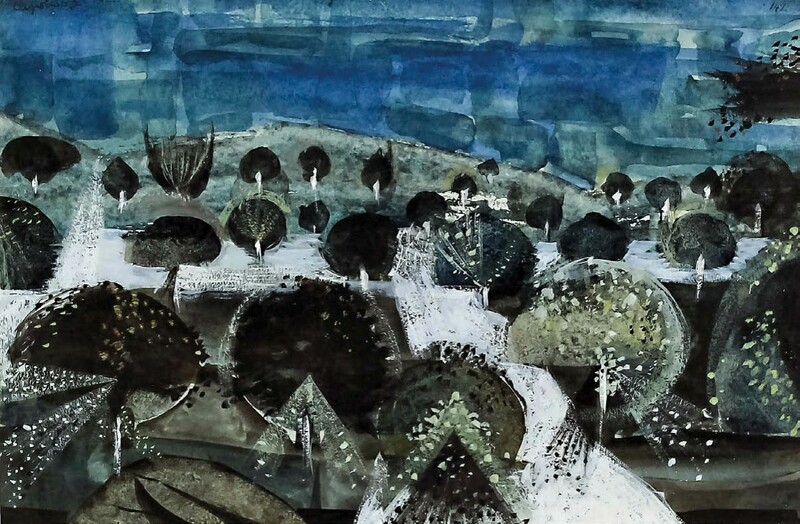 The stand-out modern British entry at Canterbury was a small, 6 x 10in (15 x 25cm), 1950s watercolour and gouache landscape by Alan Reynolds (1926-2014). It had not been seen on the market since 1965. Titled Late Summer’s Orchard, it was the last in a large Reynolds collection acquired by an English architect. He bought mainly from galleries in London, where he lived and worked, purchasing this work from The Piccadilly Gallery in Cork Street in 1965. It was bought at the auction by a phone bidder from Hertfordshire for £3000 against a £1500-2000 estimate: a solid price for a work on paper of this size. Elsewhere, a vibrant painting by John Bratby (1928-92) sold to an internet bidder from Gloucester for £4800, within the £4000-6000 guide. Thought to date from 1986, the 4ft x 3ft (1.22m x 91cm) oil on canvas of carnival revellers in a flooded St Mark’s Square in Venice comes from a large series of late colourful views of the Italian city that routinely sell for four-figure sums at auction. This example had been acquired for £1250 from an exhibition held the same year it was painted.